The concluding line from the Charisma News article that reported on the erroneous announcement of wolf Joyce Meyer’s death is itself a perfect example of rhetorical touche. But … speaking of prosperity … heresy pays, doncha know? According to the Joyce Meyer Ministries 2015 Annual Report, this particular heretic seems unlikely to die for lack of affordable medical attention. Her Gospel-malevolent ministry is fat and happy. Since it is bearing down on us, Joyce’s deceived followers can rest at ease knowing that she’ll be able to procure all the NyQuil she might need if the evil spirit of the cold and flu season should threaten to thwart her husky-voiced heresy. Having quelled the rumors of her demise, Meyers may be more immediately concerned with the misdemeanor charges the state of Missouri may be bringing her way. According to a story on the Friendly Atheist blog from Patheos, Meyer is falsely promoting herself as the recipient of an “earned Ph.D” in violation of Missouri law. 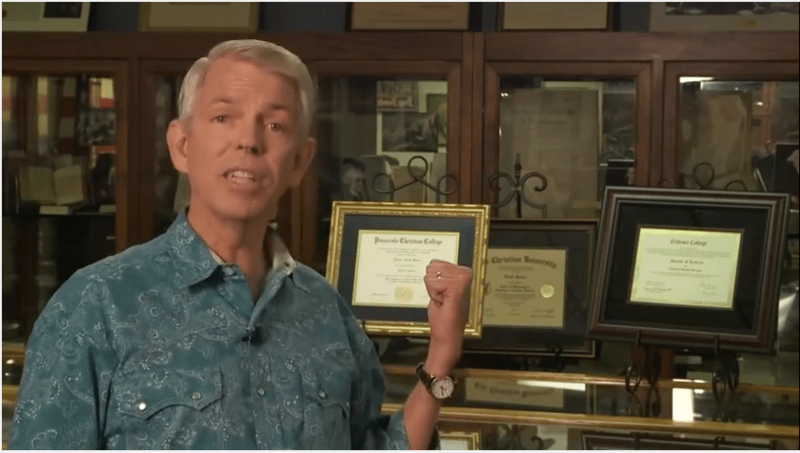 While she does have two honorary doctorates – one in divinity from Oral Roberts University and one in “sacred theology” from Grand Canyon University – Meyer claims to have earned one from Life Christian University, a Tampa, Florida-based entity reputed to be the same diploma mill that fellow TBN’er and pseudo-historian David Barton obtained his doctorate. Just for educational context, LCU is also the uncredentialed grantor of Ph.D’s to numerous other well-known contemporary charlatans, including Dr.Kenneth Copeland, Dr. Gloria Copeland, Dr. Benny Hinn, and Dr. Rodney Howard-Browne. Others are listed on their “Distinguished Degree Holders” page. From a quick review of LCU’s website, it appears that for about $2,500 you too can get your doctorate. Of course, you’ll prolly wanna be an officially ordained minister first, so you might want to log in to the Universal Life Church online ordination service where you can be ordained for free. Or, for $49.99, you can order the complete “Ministers Credentials Package.” There you’ll find other “ordained ministers” like Conan O’Brien, Lady Gaga, Richard Branson, Dwayne Johnson, and Paul McCartney.